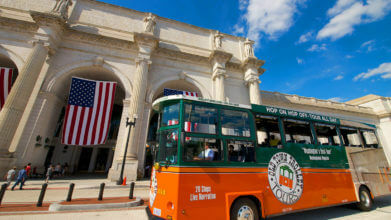 Introducing the Old Town Trolley Tours Hometown Pass Program. 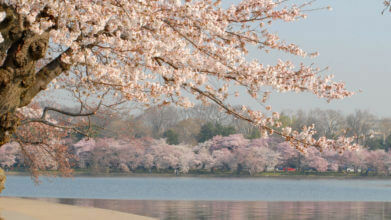 Residents of Washington DC can take advantage of our tour for FREE when accompanied by an adult paid guest. * It’s free to join and easy to use. *Hometown pass holder can be an adult or child (ages 4-12) who resides in eligible areas of Historic Tours of America tours and attractions. Each Hometown pass holder rides free when accompanied by a guest who has purchased A FULL FARE adult ticket. Accompanying adult guest ticket must be purchased at a Historic Tours of America tour or attraction ticket booth or by calling 844-356-2603. Tickets may not be purchased online and may not be purchased using any discounts or coupons. Hometown Pass is not valid for packages. Washington: All residents within the District of Columbia as well as within a 50 mile radius of the District. A Valid driver’s license, government issued id or voter’s registration must be shown at the depot in conjunction with the Hometown Pass for all pass holders over the age of 15. Sorry, we cannot accept utility bills. Hometown passes are only valid in YOUR hometown and are not transferable to other cities.